(BPT) – Outdoor living spaces cry out for an eco-friendly touch. Whether you’re adding a patio, updating a deck or livening up your landscaping, the last thing you want to do is harm the environment. Greener decorating and building practices can help you protect and pay homage to Mother Nature while creating a space where you’ll enjoy the beauty of the outdoors. For many homeowners, decks and patios are key elements of outdoor living spaces. If you plan to add either this summer, be sure to look for environmentally friendly materials like natural stone or responsibly harvested wood. When choosing wood, look for products certified by the Forest Stewardship Council (FCS) as having been harvested following sustainable principles that minimize the impact on the environment. If you’re building a patio, choose reclaimed brick or stone pavers that have been recycled from other installations. If you can’t find reclaimed pavers, look for natural stone that’s been quarried locally or bricks that have been locally produced to minimize the energy spent on transporting the products. The accessories – furniture and decor items – that you add to your outdoor environment should be as green as possible, too. Choose patio and deck furniture made from eco-friendly materials, such as recycled plastic (but avoid anything that contains PVC), reclaimed wood or FCS-certified wood. Rehabilitating older iron or wood furniture is also a great way to achieve a singular look while keeping those items out of landfills. Opt for decor items that minimize their impact on the environment while providing maximum impact on how great your space looks. 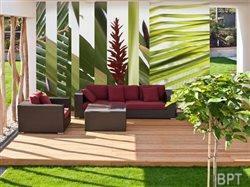 For example, a wallpaper mural can create an eye-catching focal point and set the tone for your outdoor room. Yet traditional mural painting can be expensive and traditional wallpaper can involve less-than-eco-friendly paste. A removable wallpaper mural creates a striking visual in outdoor spaces without the need for paste or glue. Murals Your Way offers a high-end product that can be moved and reused hundreds of times without losing adhering qualities. Plus, it clings to virtually any flat surface, including glass. You can choose from a myriad of graphic patterns, nature scenes and other images, or have the company produce a custom mural from your original photograph or artwork. Learn more atwww.muralsyourway.com. Continue the eco-friendly theme with lighting for your deck and patio. It’s easy to find a variety of solar-powered accent lights online and in home improvement stores across the country. You can even find decorative post caps for your deck railing that are solar-powered. Solar lights create a soft glow at night and provide accent illumination without the expense – and carbon impact – of electric power. Finally, as you’re landscaping, keep sustainability in mind. By choosing plants native to your region, you not only minimize the transportation impact involved in getting the plant from the production point to point-of-sale, you can also ensure they’ll require less watering and work to thrive. Plants native to your environment are pre-disposed to do well in your backyard. Be sure to choose plants that will do well in your particular setting, too. For example, if your backyard is very shady, plant greenery that requires less sun. If your yard gets a lot of sun throughout the day, choose plants that can stand up to hours of sunlight without the need for extensive irrigation. Check with your local agricultural extension to find out what plants will do well in your environment. The U.S. Department of Agriculture provides a free online listing of extensions throughout the country.